Logitech MeetUp is a premier ConferenceCam, designed for small conference rooms and huddle rooms. With a room-capturing, super-wide 120° field of view, MeetUp makes every seat at the table clearly visible. Motorized pan/tilt widens FOV even further: up to 175°. A low-distortion Logitech-engineered lens, Ultra HD 4K optics, and three camera presets deliver remarkable video quality and further enhance face-to-face collaboration. MeetUp's integrated audio is optimized for huddle room acoustics and delivers an exceptional sound experience. Three horizontally-aimed beamforming mics and a custom-tuned speaker help ensure your meetings sound as great as they look. Humans have evolved to associate human voices with their visible images. MeetUp's front-of-room audio provides an intuitive and coherent listening experience. With a compact all-in-one design, that minimizes cable clutter, MeetUp is USB Plug-and-Play and simply works right out of the box with any video conferencing software application and cloud service - including the ones you already use. Extremely wide field of view allows everyone in the room to be seen, even those close to the camera or seated at the edges of the room. Supports multiple resolutions, including 4K (Ultra HD), 1080p (Full HD) and 720p (HD) to optimal support the quality offered by your application and monitor. 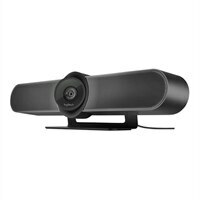 Three broadside beamforming, omnidirectional microphones with noise and echo cancellation - plus a custom-tuned speaker - are specifically optimized for small conference rooms. Enhance face-to-face collaboration to physically being there. Advanced Logitech lens technology delivers remarkable video quality with superb resolution, speed, fluidity, color balance, and detail. Zero in on close-ups of objects and whiteboard content with outstanding detail and clarity. Expand your field of view even further - up to 175° - to pan to the white board or view other areas of interest. Select up to three preset locations for the camera view and return to any of them with the push of a button on the remote control. Connect to a Bluetooth device for great-sounding audio calls. Compact all-in-one form factor takes up less space and minimizes cable clutter. Easily operate camera pan/tilt/zoom functions during meetings. Business-grade certifications mean you can launch your next presentation or video meeting with complete confidence. Easily connects to PC devices with no additional software required. Compatible with virtually any video conferencing software app, including the ones you already use. Freedom to mount MeetUp wherever it works best - tabletop, wall, or monitor - for the huddle room experience. MeetUp is provisioned with a Kensington security slot to help secure the equipment with an anti-theft lock.